”] Standing in a field of cherry-red maize and ripening pumpkins, John Moreira spotted a large insect flying amid the cornstalks. “See the praying mantis?” said Mr. Moreira, director of land management at Villa Maria, the motherhouse of the Sisters of the Humility of Mary in Lawrence County. Part of the Catholic sisters’ ministry is an organic farm, and the mantis will eat pests that eat crops. “If we used pesticides, they would be the first to die. But they help us. They are part of our team,” he said. The team is five paid farm workers, supported by an army of volunteers. They help the sisters accomplish their mission of feeding the poor and teaching how to live in harmony with God’s creation. At least half of the produce they grow is given to charity. Villa Maria, which bridges the Pennsylvania-Ohio border, is a town with its own post office, a 300-acre farm and a 400-acre sustainably managed forest. Another 26 acres hold the convent, apartments for the elderly and a vast retreat-and-conference center with amenities ranging from an indoor pool to a 400-seat chapel. It was also the site of the first hospital the sisters founded after they arrived in 1864 and began using their knowledge of herbs to aid victims of smallpox. “If you think of all the prayer and good works that have been done on this land, you can feel it,” said Juliane Arena, the marketing director for Villa Maria. But the Sisters of the Humility of Mary never farmed in France, where they were founded a decade before emigrating in 1864. “They knew how to do things like make lace and teach music,” said Sister Joanne Gardner, the archivist and director of communications. Their mission was to educate girls from French villages. But when a missionary priest begged for a few sisters to teach French settlers in the Ohio wilderness, the entire community of 11 sisters responded. They accepted a gift of wetlands that neither the bishop of Pittsburgh nor the bishop of Cleveland wanted. They farmed it where others had failed. Until the 1960s, novices worked in the field, tended cattle and collected eggs. Frank Romeo, now 76, began helping in their gardens as a 9-year-old, when his mother worked in the kitchen. In 1955 the sisters hired him to run the farm, where he still volunteers as land manager emeritus. “It was always organic,” he said, because all farming was until the mid-20th century. In its heyday it had, in addition to vegetables, 12 acres of orchards, 11,000 laying hens, 500 meat chickens, 75 beef cattle and 500 hogs. The Villa Maria community reached its height in the late 1960s with more than 600 sisters. Those who lived at the motherhouse ate their own produce and sold the rest to support their ministries. But the Catholic religious communities and American farms experienced separate crises, with both facing dramatic declines in the 1980s. By the mid-1980s the sisters couldn’t afford to raise livestock. They dissolved their farm corporation and laid off all workers except Mr. Romeo. They told him to grow potatoes and sweet corn for the St. Vincent de Paul Society. “That was the beginning of our outreach,” he said. Meanwhile, Sister Barbara O’Donnell was asking God what she should do next. After entering the community in 1965, she spent many years teaching school and religious education before taking a sabbatical in 1990. During a four-month retreat in the Adirondacks, she became profoundly aware of the beauty of the earth and the changing seasons. She read books on the intersection of environmentalism and faith. She began researching the history of the farm and learning about its operation from Mr. Romeo. She believed the sisters’ mission of cultivating the virtue of humility was directly tied to their cultivation of land, on which they were humbly dependent for God’s providence. “We see this earth as a gift from God, and we are responsible for it. We want to care for it in a sustainable way, so that we can have a healthy habitat and healthy soil for healthy food for future generations of all species,” she said. “You can’t afford to do that when you give away so much. If I had $1,000, I’d spend it on a refrigerator or a stainless steel sink for the market barn,” he said. Ed Petrus, a district conservationist with the U.S. Department of Agriculture’s Natural Resources Conservation Services, considers Villa Maria a showplace. While he has to press other growers to follow environmental regulations, the sisters are eager first-adopters of those practices who go beyond what is required. “It’s a pleasure to work with them,” he said. He has hosted meetings for other growers and conservationists at the villa. “Walking around, seeing people actually implementing all the things we are talking about, is very rewarding,” he said. A greenhouse was erected a decade ago to raise poinsettias and Easter lilies for sale. A small herd of cattle supplies the sisters with their own diet of organic beef. They also raise sheep. Mr. Moreira grew up working on his grandparents’ farm and had a master’s degree in sustainable agriculture. But he was supporting his family with a print shop when he saw “a very odd ad” for a “full-time seasonal organic gardener. “That’s as rare as a diamond in dust,” he said. He was soon promoted to director. The sisters encouraged his passion for old growth forests. Their oaks, maples and hickories are lightly harvested, with an eye to retaining trees needed to sustain wildlife or protect wetlands. Last year, blight destroyed the tomato crop in less than a week. Mr. Moreira applied no fungicides and used crop rotation to stave off the deadly fungus this year. Because potatoes are vulnerable to the same disease, the workers and volunteers moved their biggest give-away crop to a field nearly a mile away. “At this point, it seems that it’s working,” he said. The farm takes immense labor, much of it volunteer. Individuals and families can do service retreats there. A high-ranking executive of a major corporation has helped at the height of spring planting for several years. “It’s her vacation, and she’s working 10 to 12 hour days to help us plant all of our crops,” Mr. Moreira said. Two social service agencies offer youth offenders from the inner city the opportunity to work on the farm as an alternative to incarceration. Mr. Moreira said they have a great work ethic. “They are fascinated by certain things. If one of them finds a bird’s nest in a blueberry patch, they all go over to look,” he said. Long-term help comes from college interns and post-college volunteers who donate a year. After graduating from Xavier University in 2009 with a degree in social work, Rob Goeller, 23, spent a volunteer year with Americorps before taking the sisters up on their offer of food and housing for labor. “Everyone I graduated with who hasn’t done a year of service is unemployed,” he said. On Tuesday he was picking pumpkins. He had already gained experience mixing cattle feed, castrating calves and loading up boxes for donation. “It adds a lot of meaning to what I do to know that half the food is going to shelters and food pantries.” he said. The sisters recently gave 746 pounds of zucchini and squash to the Greater Pittsburgh Food Bank in Duquesne, which supplies local soup kitchens and food pantries. “When they first called us about donating, they wanted to make sure that we didn’t sell the produce. That was their concern,” said Michelle Herrle, gleaning coordinator at the food bank. Whatever isn’t given away, sold or eaten becomes compost. “The sisters won’t use anything that isn’t compostable,” Ms. Arena said. Composting is one of the lessons they teach in classes, camps and retreats. “They are very concerned to educate the laity about what they do, because no one is sure about the future of these lands,” she said. The sisters are aging, and they want to ensure that others — even if they aren’t sisters — will carry on their legacy. The community numbers 171 now, with the majority living outside Villa Maria. Many work in schools and health care, though one runs an orphanage in Haiti. Villa Maria is home to 47 sisters, most of them retired. They can’t work the fields, but many have organic flower gardens and some make oils or wreaths from Villa-grown herbs. Those are sold with produce in the market barn, which is open to the public for half-days, Wednesday-Saturday. 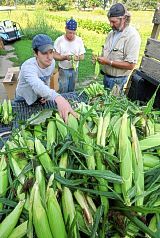 Each year the season ends with a public Harvest Day Celebration, which will be held from noon to 5 p.m. Oct. 2. The food is all from Villa Maria. There are hayrides, drum circles, games, crafts and composting lessons. The last produce of the season is sold. The celebration began 11 years ago to thank God for the harvest and to thank the volunteers for their labor. But 1,200 came last year. Villa Maria can be reached at www.humilityofmary.org or 724-964-8920. First published on September 12, 2010 at 12:00 amAnn Rodgers can be reached at arodgers@post-gazette.com or 412-263-1416.